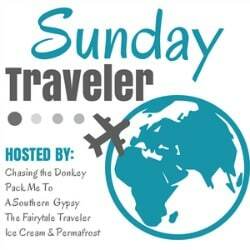 Today I am linking up with the #sundaytraveler linkup! Thanks to Pack Me To! I just returned home from the Texas State Fair and lets just say that I ate my fair share of fried foods. If you ever find yourself in Dallas during the State Fair or the Texas v. Oklahoma game, you are in for an incredibly good time. It may seem like a silly event, but it is actually a lot of fun and a must-see in my opinion. If you aren't familiar with the Texas State Fair it is home to more fried foods than any other place in the world. We started out the morning at the most popular stand at the fair: Fletcher's Corny Dogs. I read once that Fletcher's sells over 600,000 corn dogs during the State Fair season! The corny dog is an old state fair favorite and a great place to start out. But then I wanted to get serious about trying the brand new, award winning Fried Shrimp Boil. I forgot to take a photo so I borrowed this one from the USA Today. The fried shrimp boil was shrimp, corn and potato fried like a hush puppy. It was really good, but didn't quite hold a candle to some of my old favorites: fried butter, fried Oreo and fried jalapeno shrimp. After that we were feeling pretty full and it was almost game time, but that didn't stop us from getting an order of fried pickles first. I was mostly done with fried foods at this point, but semi-disappointed that we didn't try the other award winner: fried sriracha. Of course, there is always next year. Texas didn't win the football game, but it was close and we had a great time at the fair and the game. And of course at the end of the game I got to drive home to Austin and the Oklahoma fans had to drive back to Norman. So I feel like the big winner anyway.